Brush up on your lighting knowledge before you shop. It has often been said that lighting can make or break a room—and it's true! Having enough lighting is indeed very important to setting the mood throughout your home and table lamps are one way to ensure this. They provide task lighting for reading and they also emit warm and cozy ambient lighting for any room. Not only are table lamps useful, they are also a fun way to express your decorating style or add an unexpected finishing touch. 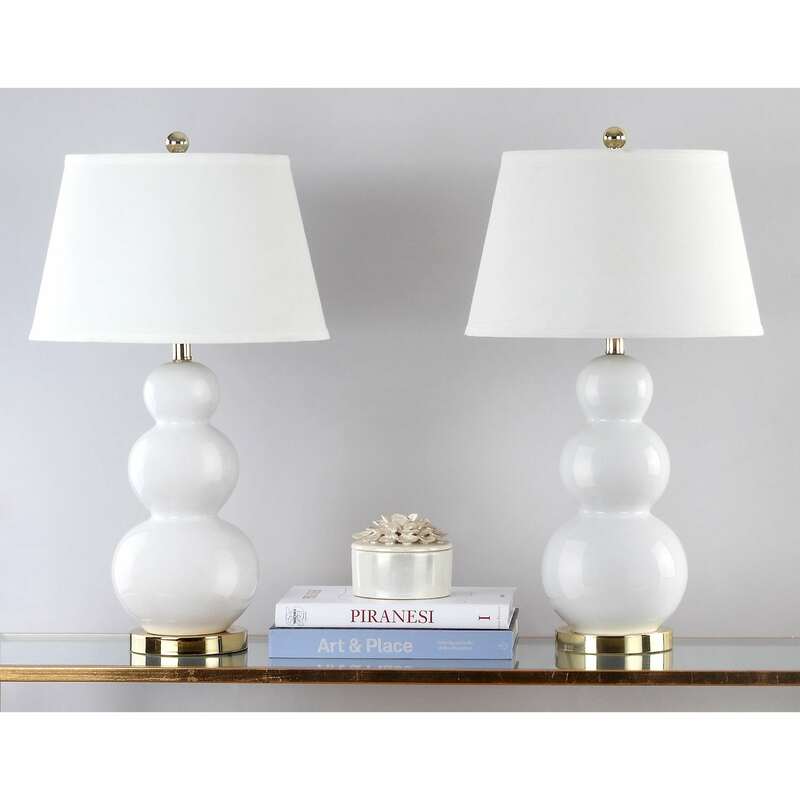 While the variety of table lamps available to shop online is almost dizzyingly huge, it is possible to boil them down into five basic types. A gourd lamp is characterized by a curvy, bulbous base that resembles, well...a gourd. This shape is particularly popular—especially in the colorful ceramic variety. Gourd lamps can also be fashioned out of colored or clear glass, mercury glass, or even metal. They look great at bedsides, as an accent lamp, or in pairs on a sofa table. If you like mid-century modern style, check out the droplet or teardrop variation of this style. This type of lamp says, "I'm traditional yet fresh and fun. I love a casual atmosphere, and having friends over for happy hour." This type of lamp can match a number of different styles, however, dependent on how much ornamentation the lamp has, or what it is made of. A sleek chrome version would look great in a modern space, while a wooden one would be better suited in a modern farmhouse, for example. This type of lamp says, "I'm a little bit fancy, always elegant and I like to host sophisticated dinner parties." Tiffany-style lamps, named after the famed Louis Comfort Tiffany, are replicas of the leaded glass originals originally made by their namesake. The shade -- not the base -- is the star of this type of lamp. The motifs depicted on the shades of Tiffany-style lamps can be Victorian, Mission or Art Deco in nature, and are therefore well-suited to homes that evoke one of those periods. Tiffany-style lamps are best-used as accent lighting. This type of lamp says, "I'm classy and appreciate period antiques. There's nothing I like better than a thick book, a cup of tea, and a roaring fire on a rainy fall evening." Pharmacy, or swing-arm table lamps, are great for task lighting because they can swing and bend to shed light right where you need it. These, too, can suit a number of different tastes, depending on the lamp's finish and detail. This antique brass one, for instance, is well-suited to a traditional space, while one with a caged shade and an exposed bulb would fit a room decorated in an industrial style. This type of lamp says, "I'm practical without sacrificing style. I like a mix of old and new and don't shy away from a little edge." Almost any other kind of table lamp can be lumped into the category of novelty lamps. There are lamps with bases in the shape of animals, seashells, vehicles... Almost any kind of object can be fashioned into a lamp. A novelty lamp might also come in an unusual but not-quite-namable shape or pattern. A novelty lamp can either match a decorating theme, such as a garden or jungle theme, or its uniqueness alone can serve as a conversation piece in an eclectic space. Novelty lamps also work in nurseries or children's playrooms to add a touch of whimsy and inspire imagination. This type of lamp says, "I'm not afraid of being quirky and playful, and I like to be the center of attention."